I was fishing the Delaware a few weeks ago and as I floated downriver I could sense wondering eyes. Not on myself and my SUP Yak but on a yellow rod hanging off the back of the yak. Amongst the high end nano rods and classic bamboo rods that every other angler on the Upper Delaware sported, the yellow rod was an apparition. Many anglers have the Eagle Claw Fiberglass rods as backups or maybe even as their primary rods. At sixteen dollars, you can buy several dozen of them for the price of one high end rod today. Those that own them, love them. You can add me into that crowd. Over the past few years as we ventured into using switch/spey rods on the Great Lakes tributaries, we fell in love with spey casting. As the steelhead season came to a close we routinely found ourselves using single hand spey tactics on our trout streams. More often than not we reached for the second handle that wasn't there. We yearned for it, to make things a little more easier. Adam decided to take matters into his own hands and began performing surgery on several cheap low end rods in his arsenal. This culminated this past winter with the creation of the Eagle Claw Switch Rod. Warning: This post has been a long time in the making (people have been asking for it) and it isn't exactly an expert guide to building a rod. We don't build rods, nor do we have any general idea how to do so. This a product of the DIY mentality without any consultation of the internet, rod builders, or friends. If you are a rod builder, you can go ahead and laugh your way through this post. Begin by using a hack saw to cut off the back end of the reel seat. In the picture below, I am actually sawing in the wrong spot since I am sawing through solid nickel. You should actually cut at the beginning of the rings. Once cut, you expose the blank in the reel seat. In order to properly seat the switch/spey handle onto reel seat, you will have to sand down your cut as well as break apart some of the blank. It will depend entirely upon the handle you have bought. We used an arrow shaft to connect the switch/spey handle to the reel seat and also add some extra weight to balance out the rod. Insert five minute epoxy into the grip and along the arrow shaft. We used a circular motion to evenly spread the epoxy out in the handle. Make sure that the arrow dries in a vertical position. 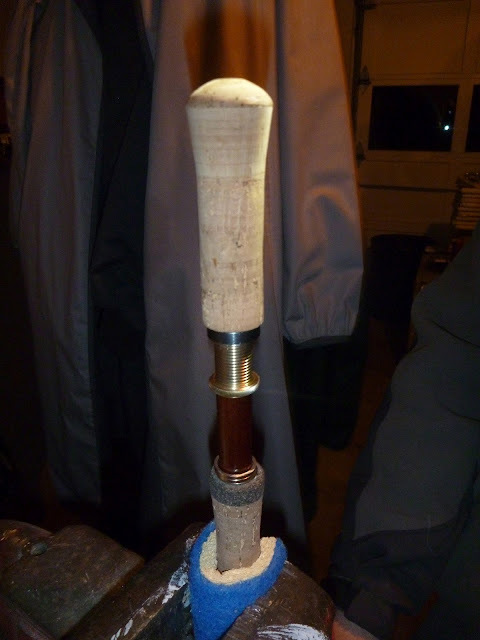 Once dried, we repeated the same thing to insert the arrow shaft and grip into the fly rod blank. In this case, the arrow shaft was cut to a length where it only extended past the cork a few inches. Let it dry and the rod will be ready to use as soon as the epoxy dries. Overall, the process was incredibly simple. One major drawback with the Eagle Claw rods and other fiberglass rods are their increased weight and poor swing weight (tip heavy). 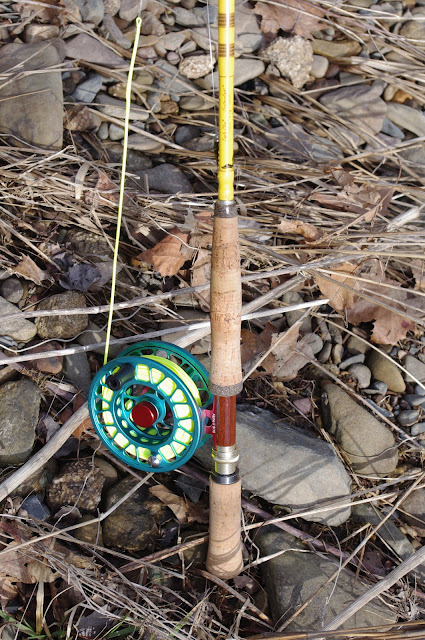 The second handle and arrow shaft created a perfect balance with the fly rod. It allows you to more comfortably fish it as a single hand rod while allowing you to use skagit/scandi casts to launch double fly indicator rigs where ever you want. The 8' foot 5 weight model plays more like a 6-7 weight and I found the 6 wt. Rio Outbound Short to perform well on this rod. As for using a true double hand line on the rod, experiment if you have several heads in your arsenal. It will cast a scandi/skagit line. Will it be pretty? Hell no. Will it be fun? Hell yea. I played around with creating a short head using a combination of spey cheaters. I was looking for something around sixteen feet. It casted pretty well with a 10' Rio versileader and I was on a tiny freestone stream with thick cover on either bank. However, one major drawback with the short length is mending and tracking the swing. So far, we've had a lot of fun with this rod. It has landed carp up to sixteen pounds and is a really fun indicator nymphing tool if you like really long drag free drifts. The cork will probably fall apart in your hands as you fish it and you can find better performance buying a 5 wt. switch but it wouldn't be an Eagle Claw would it? This is a cheap alternative with the emphasis on: FUN. Nice clean job. Looks very professional. 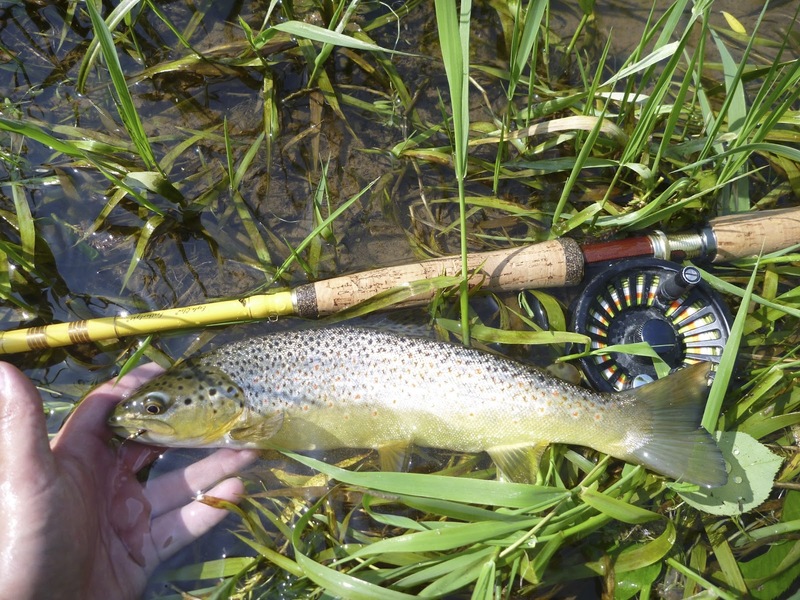 Where the hell can you find eagle claw fly rods? My very first rod (which was a spinning rod) was an eagle claw and I loved it. I've been looking for an eagle claw fly rod since I began fly fishing many moons ago and have never been able to find one. Cool idea on the arrow shaft. I love this. Thanks for sharing Mark. Awesome idea. Being a handy man myself really a great idea and process. I've got to make one now. Adam actually purchased them at the Somerset Fly Fishing Show back in February from a booth. Thats about as much as I know about where they are from. I don't know the brand name either. Hey have you ever tried using crossbows? I thought it would be something worth a try along with fly fishing. I still want to Find Out More about the stuff. I am still a novice on both arts. I really appreciate blogs like these. It comes in handy if you want to add to your knowledge. Thanks for sharing. Wow nice post! You should try the Sage One. My husband is in love with it.